Nick Archer a member of the 1967 and 1968 NCAA Championship team for Michigan State University. Nick was one of the St. Louis contingent that was heavily recruited to attend Michigan State. 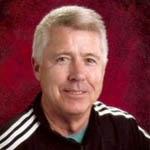 Nick decided to stay in the East Lansing area and for the past 35 years for boys and the past 25 years for girls has won a combined total of 20 Conference and District Championships and just recently won his fifth Michigan State High School Championships.